The LIVESTRONG Foundation’s coveted four-star rating puts it in a very select group of high-performing charities and indicates that it adheres to good governance and consistently executes its mission in a fiscally responsible way. This rating, now with our new accountability and transparency metrics, demands even greater rigor, responsibility and commitment to openness. [Doug] Ulman and his team were responsive to the media and candid with key stakeholders about their disappointment with Armstrong but commitment to the LIVESTRONG cause and its beneficiaries. That [fielding all media and donor inquiries] was the brilliance—to be willing to enter the center of the storm when most would duck and cover. Having a resource like that [LIVESTRONG’s free cancer support services] is priceless… It’s literally giving a guy like me a chance to walk away from this disease. I just know that when I need it, the Foundation will be there. Being [at a LIVESTRONG event] with hundreds of cancer survivors and their loved ones…and feeling the love and energy and bond…Multiply that by hundreds of thousands. That’s what LIVESTRONG does. Some people at the top become isolated and siloed and just start making decisions, cutting heads, cutting programs.” Not Mr. Ulman. He has tried to include staff members at every turn by being as open and accessible as possible. “It was a smart move to boost loyalty. When you can reach down in the organization and engage them on the question of how can we get out of this, it really pays off. I want LIVESTRONG to survive… LIVESTRONG is in my mind the No. 1 cancer navigation system for patients in cancer care right now. The LIVESTRONG Foundation, above all else, stands for hope against a constant and demanding battle in humanity’s war versus cancer. They [LIVESTRONG Foundation] are a big player. Their views are respected because they have strong connections with patients.”…One of LIVESTRONG’s key accomplishments, says Ms. Nasso, was to help members of Congress better understand that cancer patients need help with treatment and recovery, not just research on a cure for the disease. In the past, she says, lawmakers weren’t as interested in giving federal aid beyond research. We are incredibly proud to help fund the LIVESTRONG Foundation’s cancer support services, which has served 2.5 million people affected by cancer. The LIVESTRONG Care Plan provides cancer survivors with the information they need to move on after treatment with an understanding of the potential effects and follow up needs. The LIVESTRONG Foundation plays a crucial role in the worldwide fight against cancer, with thousands of cancer survivors relying on its resources daily. Doug [Ulman] and Katherine [McLane] were able to grasp the gravity of the [Lance Armstrong] situation and the significance of their actions for cancer patients worldwide, and their swift, decisive response helped to ensure the viability of this important organization for years to come. Every time I have contacted them [LIVESTRONG], one of their case managers has called back within (an) hour and began working on and solving my problem. No other organization will do that for every cancer victim. Whatever sins Armstrong committed in the world of racing, they don’t erase the good work that the Foundation has done in fighting cancer. LIVESTRONG has always been about more than one person. Fortunately, it has taken on a life of its own. We are honored to be a part of the LIVESTRONG Foundation’s ongoing efforts to help those affected by cancer. Special events, such as the car2go Marathon Relay, continue to emphasize the Foundation’s commitment and allow car2go members to give back to the community. Cancer activists will come to Capitol Hill for the One Voice Against Cancer Lobby Day, where patients, survivors, physicians and researchers will push for funding for cancer research and prevention programs. Volunteers with the LIVESTRONG Foundation will join more than 10 other groups, including the American Cancer Society Cancer Action Network, for more than 150 meetings with lawmakers and staff. The charity’s work demonstrates how a nonprofit can successfully lobby for legislative issues that support its mission without crossing a political line…One of LIVESTRONG’s key accomplishments…was to help members of Congress better understand that cancer patients need help with treatment and recovery, not just research on a cure for the disease. They found a way to anchor their identity in something other than a celebrity. If you think back, you began to see less and less of Lance, and more and more grassroots, local stuff popping up all over the place. 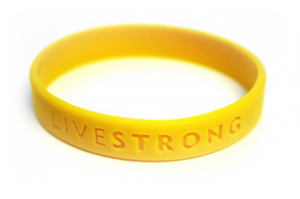 LIVESTRONG had fostered something that was organic and real; it resonated with people on a human level. It was about them, and people knew it. It was and is about a community of people with a common bond. LIVESTRONG gave them a voice and a symbol. I think people who really appreciated and appreciate LIVESTRONG did and do so because of its meaning in their fight against cancer, not because of some guy who could ride a bike really fast. Back in 2006, I attended the inaugural LIVESTRONG Summit with 1,000 cancer survivors, advocates and activists. It was a seminal few days in Austin for me for several reasons. First, this was a first-of-its-kind gathering in the world. Second, it came on the heels of the founding of the LIVESTRONG Young Adult Alliance, a think tank of scientific and nonprofit leadership focused on improving the lives of young adults with cancer. Third, it was framed purely around the issue of cancer survivorship. Not cure. The audience was filled with angry healthcare consumers (e.g., patients) who were sick of the system while struggling to get busy living, intolerant with the stagnation of the status quo and demanding of systemic change from the only major national charity that seemed to actually care about us.